Firstly, as a self-plug, I'd like to thank Anjin Anhut for mentioning me in this article about concept art. 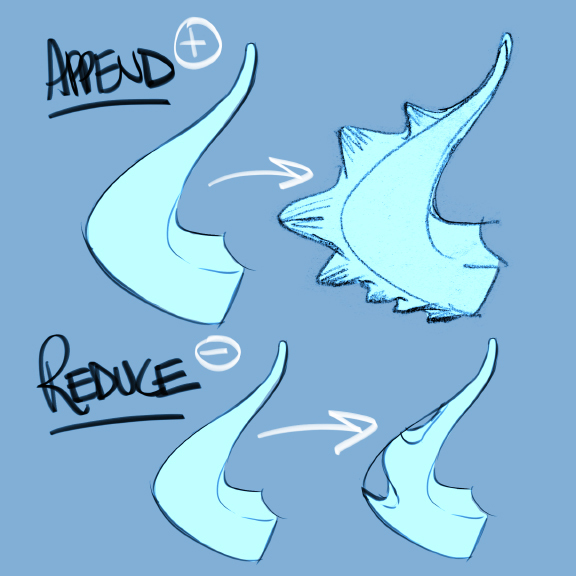 Though most of my activity is on tumblr now, I'm taking my blog out of retirement to post what, for many of you, will be a remedial tutorial about form. While it might not be overly academic, it is an honest account of my structural thought process. 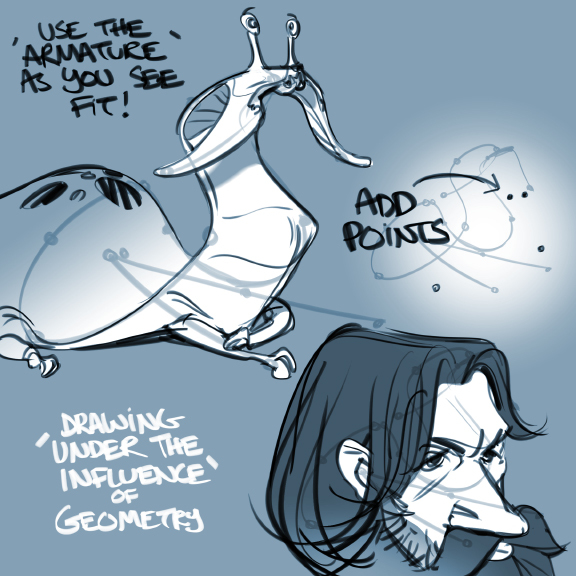 What if constructive drawing could feel like wielding magic or weaponry, instead of some mathematical chore? Good news : It can! In this talk, we'll temporarily set aside things like horizon lines and vanishing points, dealing only with our general sense of perspective. For some, this sense will be more developed, for others, not as much. Along the way, we'll touch on many concepts which are second nature to 3D modelers. Their tools are our tools, and have been all along. Mistakes will be made, but be forgiving! Our flawed, human construction will actually aid us in ways perfect, computer-driven construction won't. 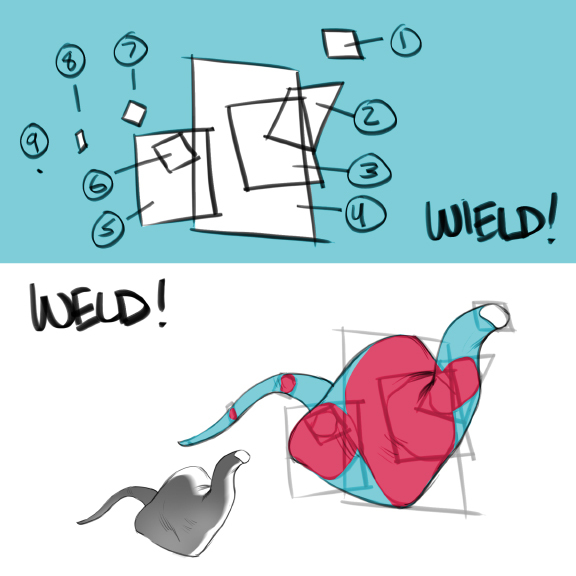 The idea will be to wield the geometry we know, then weld it together to create the rest. So, without further ado, let's begin with the first part : wielding! Trends in art come ago, but primitive geometry stays the same. Here are some familiar characters. Time with the primitives is time well spent, so get to know these guys. 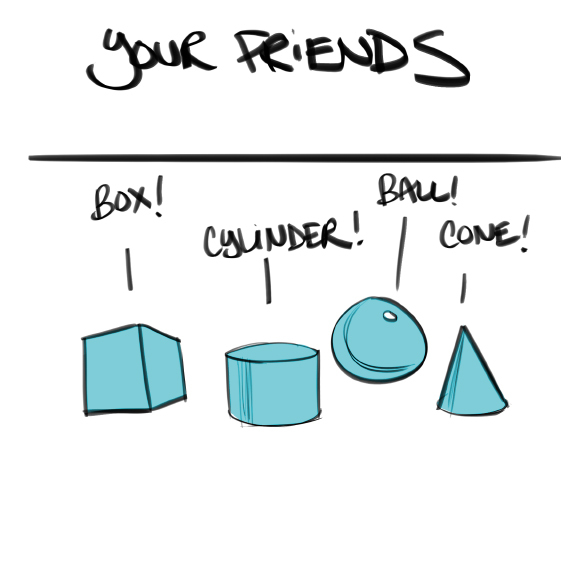 They are your friends! Also, get to know the primitives in their inside-out states! 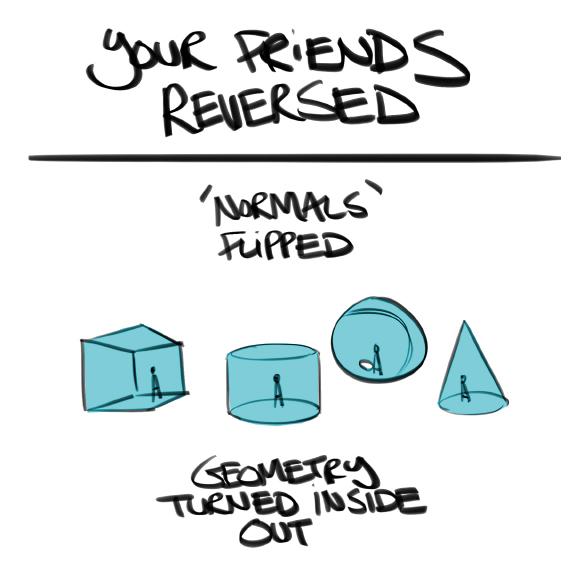 In 3D modeling, this reversal is known as "flipping the normals." A "normal" is the direction a plane faces -- outward, inward, up, down, left, right and everywhere in between. 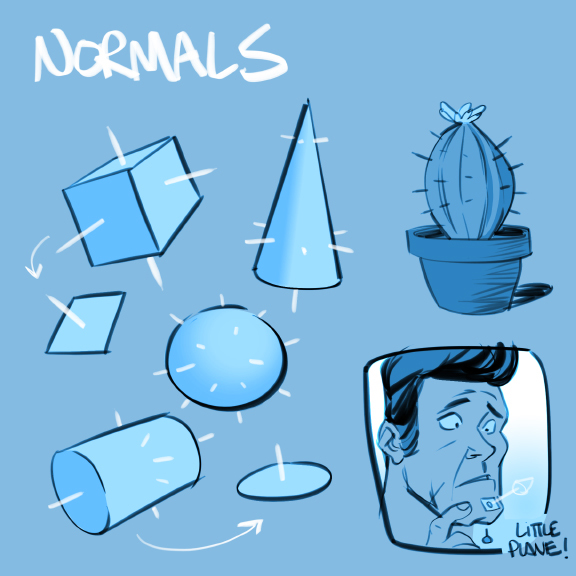 Think of normals like thorns on a cactus, pointing in the direction of the planes they lie on. If you have difficulty envisioning what an individual plane looks like, think of a little piece of tissue paper on the chin of someone who's cut themselves shaving. Here are the primitives stretched along the vertical axis. You can perform this pull horizontally as well, stretching the geometry out like taffy. Here is the geometry squashed flat. These are our hockey pucks, droplets, mouse traps, etc. Here is the geometry pushed to one side. Here is the geometry pinched at one end and bowed out at the other. Here is the geometry with all its sharp edges filed down. The opposite of rounded geometry is "faceted" geometry, as seen in diamonds. Here is the geometry doubled over, creased or drooping like flexible noodles. 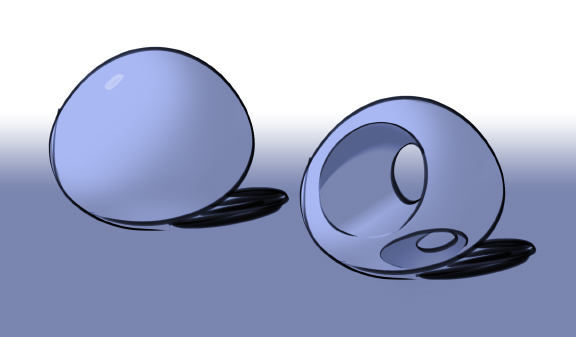 Two curled cylinders joined at the ends form a another, lesser-known primitive called a torus or toroid. Here's what happens when we crossbreed primitives. There are many, many combinations, so experiment with mating them to produce different offspring. We can modify the primitives in all sorts of ways, shearing them off, creating convexities (lumps) or concavities (dents), or punching them full of holes! 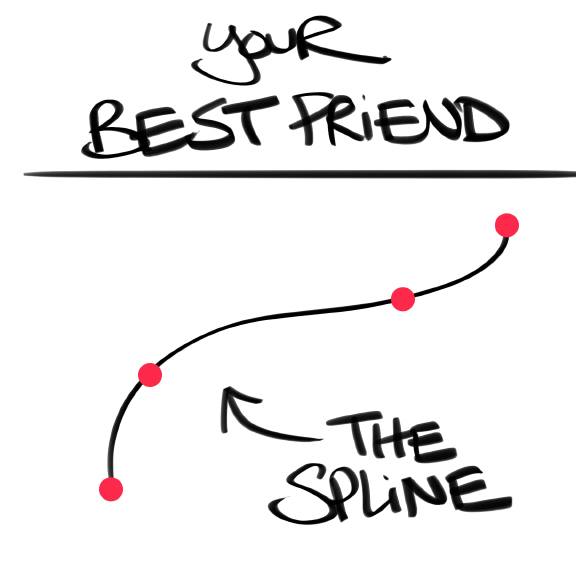 Perhaps your best friend of all is the spline. 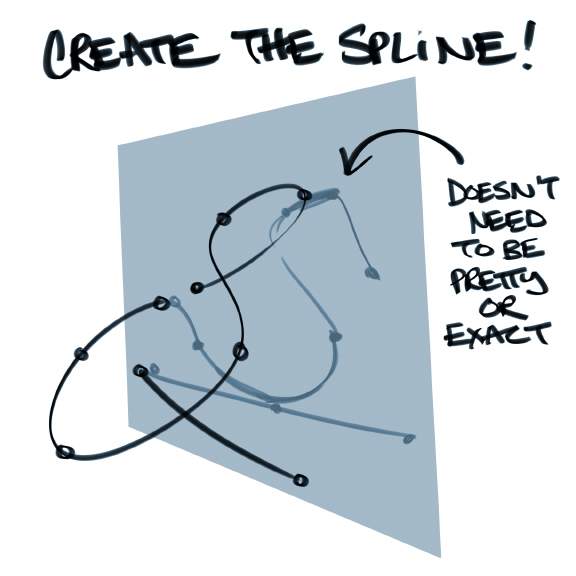 A spline is a line which exists in space. 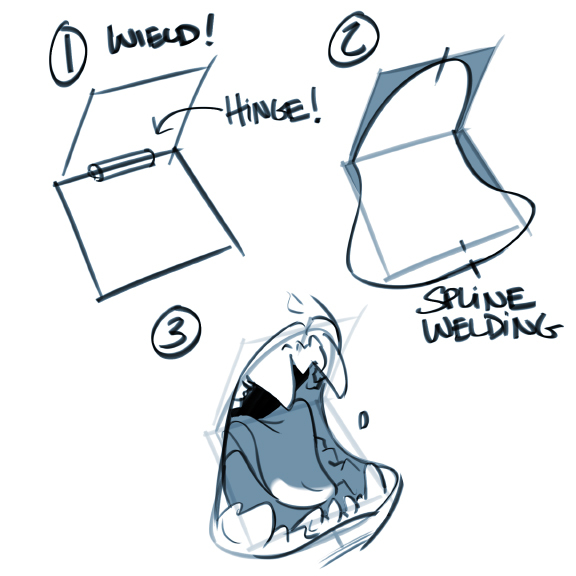 They can be used to construct (wield) or connect (weld). 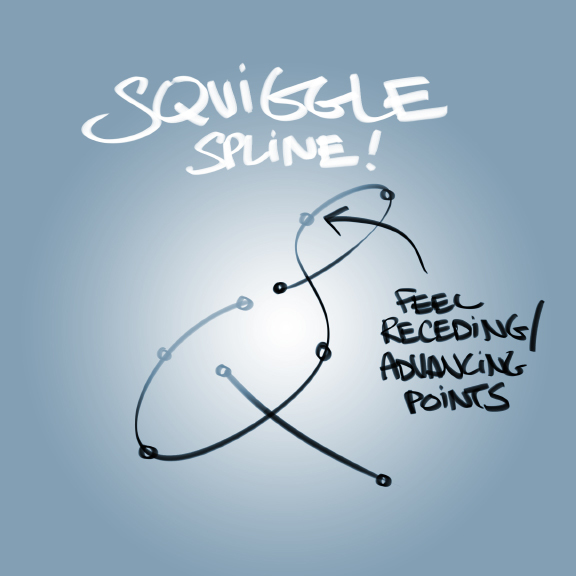 Splines are simply points (dots -- the simplest marks) joined by straight lines or smooth curves. 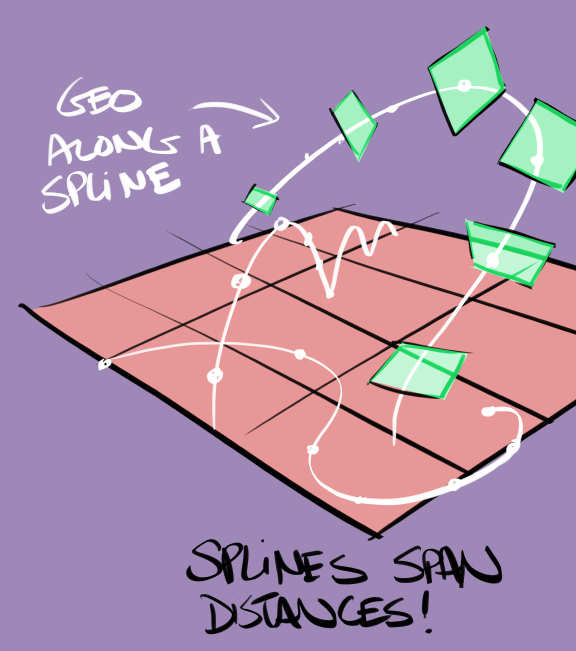 While mere lines rest, splines travel, sometimes spanning great distances and "touching down" in random places in their environment. If you've ever captured a firefly in a jar, you've seen a tiny glowing "point" create wavy flightpaths. When we imbue our lines with the gestural playfulness of splines, each mark we wield becomes living geometry. 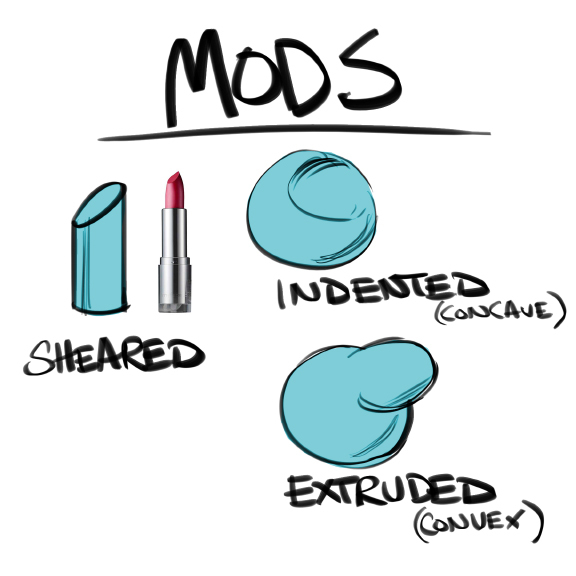 Now that we've discussed the basic forms to be wielded, let's discuss ways of making them pretty. Viewing a primitive at an angle where its sides appear equal creates an undesirable redundancy. (Unless you're intentionally going for a sense of balance or stability -- There are always exceptions). 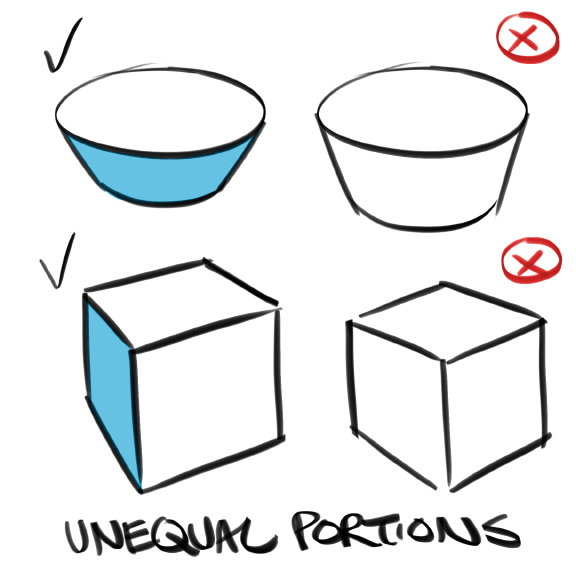 Tilt or shape your geometry to introduce unequal portions. 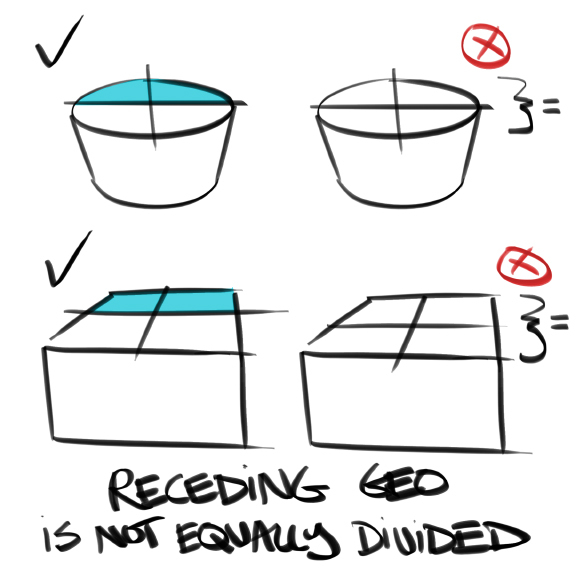 Center lines in receding geometry do not occur at mid-length. True perspective creates an unequal center division in most cases. Let's call this the off-center center line. Above we see the off-center center line dividing a simple plane (1), within which (2) and on top of which (3) we have constructed a nose. Because the two sides of the plane were made unequally, one side of the nose appears slightly larger and more dominant. 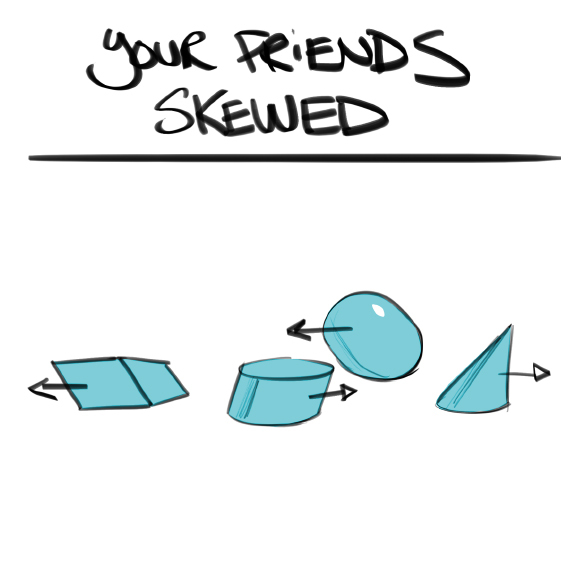 This lack of redundant, "twinned" geometry is desirable. 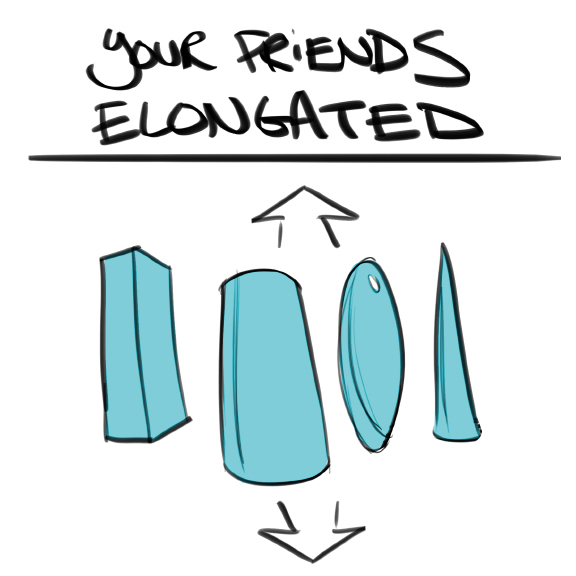 Furthermore, the back of receding geometry will always appear smaller than its front. Get these big/small relationships right, and you will have a sort of shorthand perspective which will be sufficiently convincing and attractive. 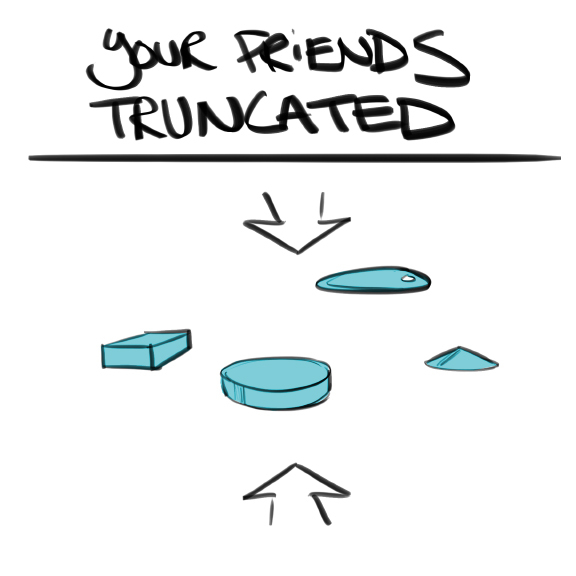 To avoid redundancies in volume, switch up small, medium and large geometry. OFF-AXIS GEOMETRY is simply geometry tilted slightly (or dramatically) away from dead-on front or side views. In nature, we barely ever see anything that isn't tilted toward or away from us. 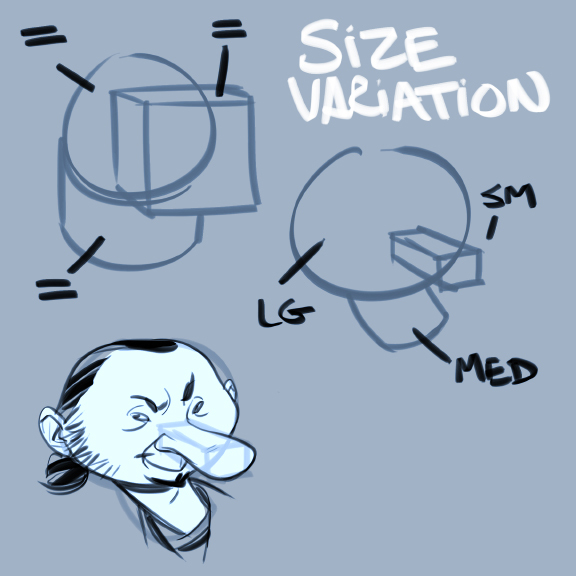 This is why model sheets with orthographic views appear so bizarre, and are hard to make look appealing. Where liveliness and attractiveness is desired, avoid dead-on geometry. ALL-AXIS GEOMETRY has objects facing in many directions, which is something real life presents us with all the time. 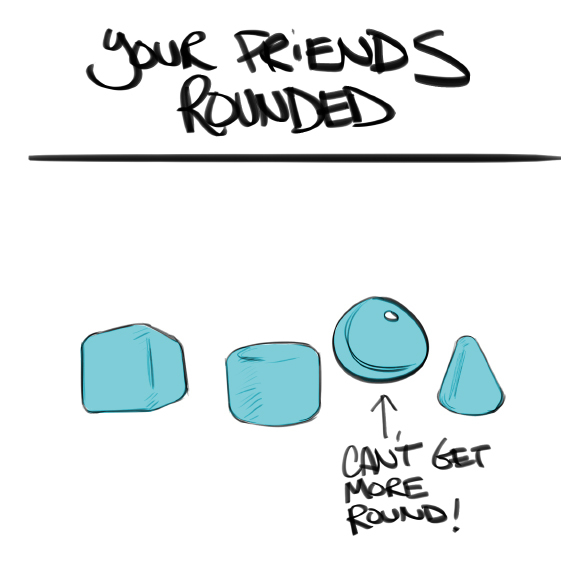 If a drawn object appears flat or stiff to us, a contributing reason may be lack of axis diversity. WRAPPING GEOMETRY is any intersection or enclosure where things are seen to travel around each other (i.e. a dog collar). It produces a strong, overlapping depth cue which puts drawn geometry into the 3D realm faster than anything. VARIED GEOMETRY makes use of several or all of the primitives in the same scene, which, again, is true to what we experience in real life. If everything in a scene is spherical/curved, or everything in a scene is cubic/straight, we will sense that something is off. OPPOSING GEOMETRY is geometry intersected by other geometry of a dramatically different "normal." 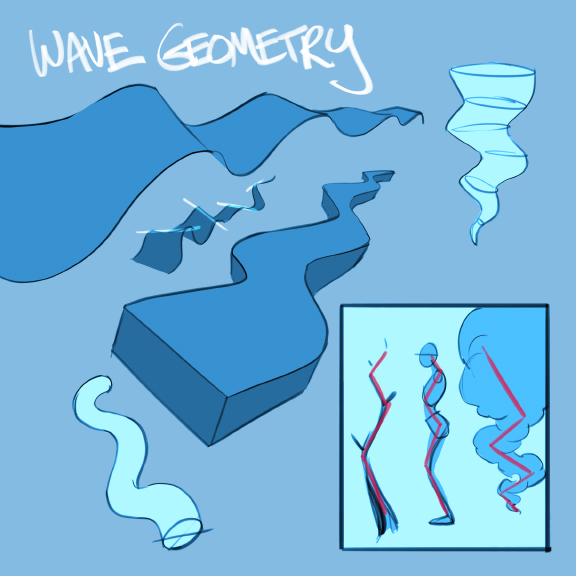 It goes against the grain, and plays a part in "wave geometry" which we'll get to soon. And example of opposing geometry are two hinged planes, wielded and welded here to create an open maw. 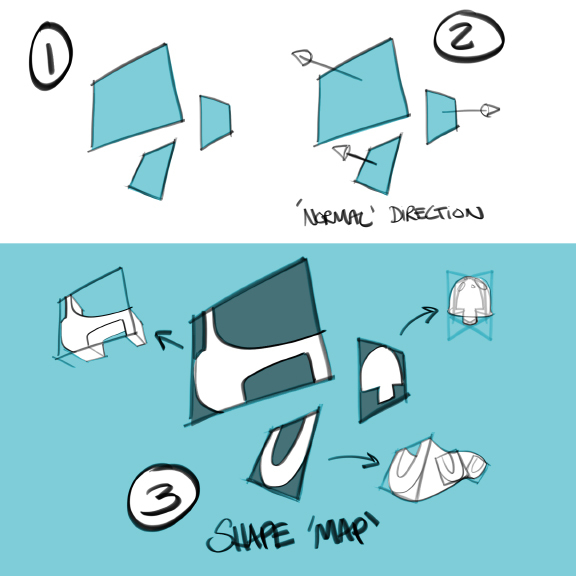 Cross-sections are complicated shapes we can 'map' onto simple planes for further manipulation. 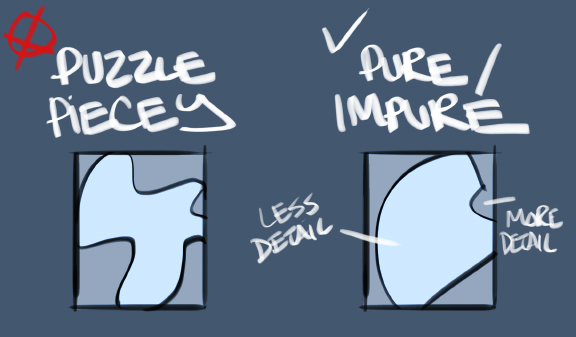 When making cross-sections, it's best to avoid "puzzle piecey" shapes that are busy all the way around. 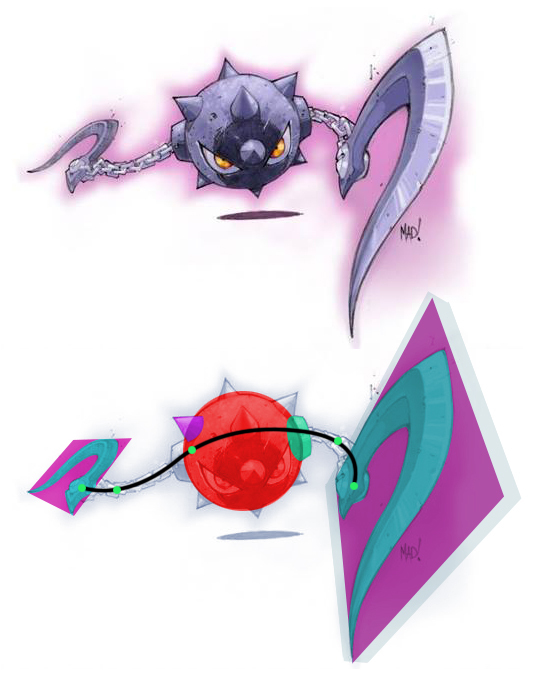 Balance pure (simple) sides with impure (more detailed) ones. Once you've mapped a shape onto a simple, 2 dimensional plane to create a cross-section (1), you can then extrude it (2). See here how different sides of the plane can be assigned as "hinges" to produce wedged extrusions (3). 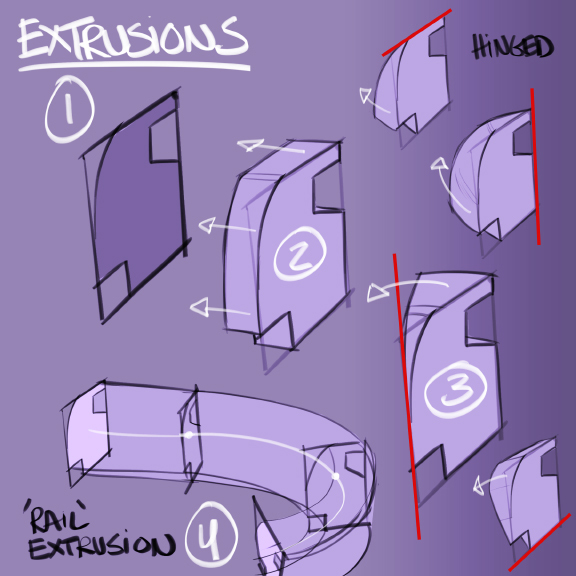 Rail extrusions (4) occur along a spline. In our world, we rarely see objects arranged in neat rows, with all component parts visible. Objects are stacked, one in front of the other, sometimes densely so. To prevent ourselves from over-representing, we must obscure. 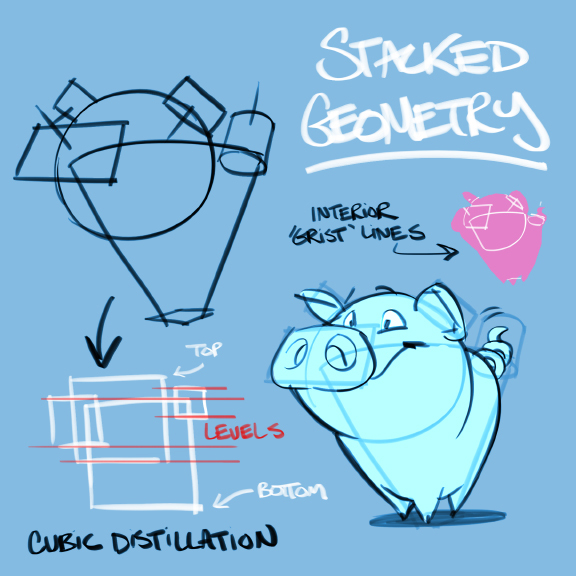 See what kind of interesting "stacks" you can wield, varying the types, numbers, sizes and elevations of geometry used. 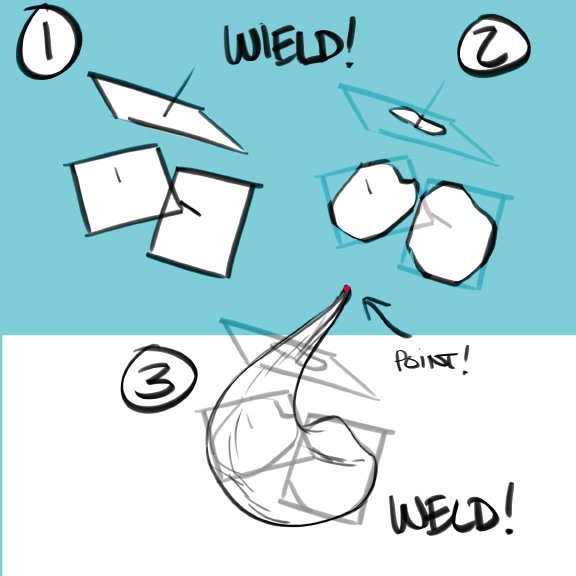 The welded results will automatically possess an overly-dreaded aspect of drawing called "foreshortening" and produce a level of depth which is more in accordance to what we see. As pleasant a bonus, the overlapping lines of construction will provide "grist" for our imaginations, suggesting additional forms within the forms. You can see in the following images how cross-sections mapped onto planes can be wielded and welded to create volumes -- another way to stack geometry. Geometry looks fetching when the individual parts are, in some way, made for each other. 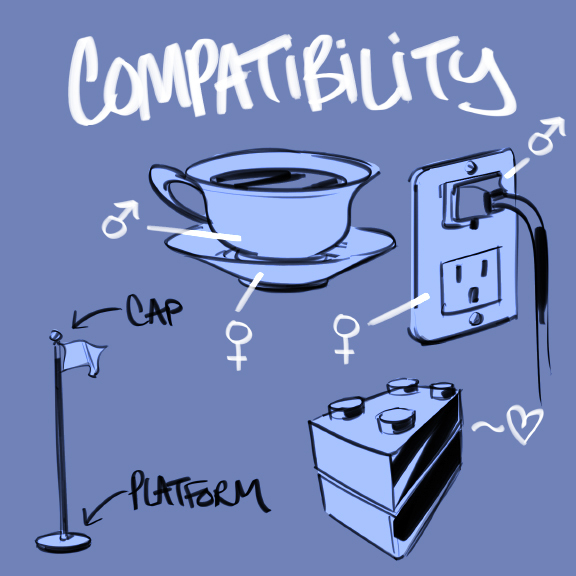 The cup and the saucer, the plug and the outlet, and the blocks are designed (via male and female parts) to interlock. In addition to fitting together, many things have a platform and a cap. An example of a flagpole has been used here, but a flower, a church wall or human being would have worked just as well. If symmetry is nature's calling card, wave geometry is its blood sample. We see its alternating rhythms in everything from tree branches, to human anatomy to plumes of smoke. The more irregular the wave, the more natural it appears. Joseph Gilland, in his book Elemental Magic, points out that our DNA, ocean waves, fire, mountain ranges, and entire galaxies all present versions of wave geometry. After we wield simple geometry, we're free to add and subtract from it, thereby complicating it. Complicated geometry is harder to wield, which is why we save this detailing pass for later. In 3D, these are known as 'boolean operations' and will often cause errors in even the most sophisticated applications. Author's note : The 'append' portion here was drawn on paper with a pencil. I find I have greater speed and control wielding and welding with these materials than I do with a computer. Find the method which best suits your unique needs! 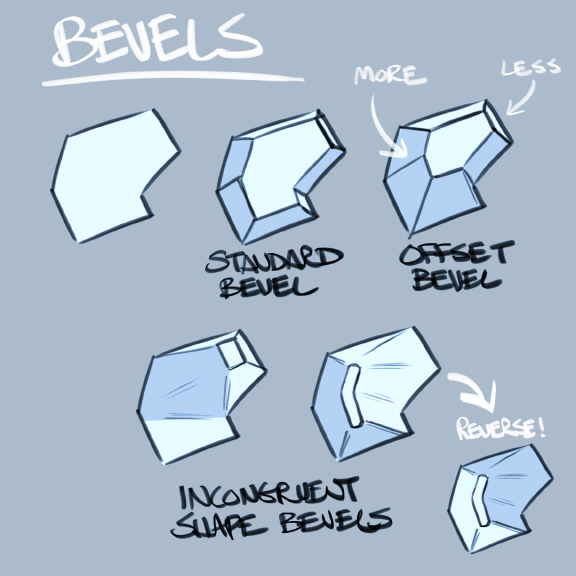 Bevels are other "complicators" to be considered after the underlying geometry is understood. 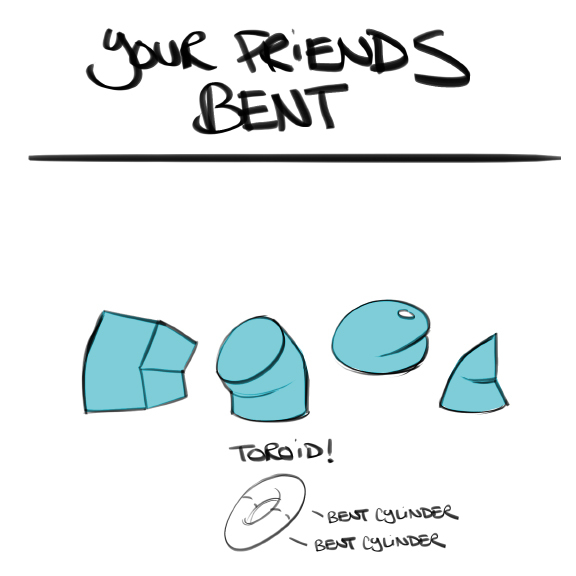 It's interesting to note that the position and shapes of bevels don't need to be predictable. 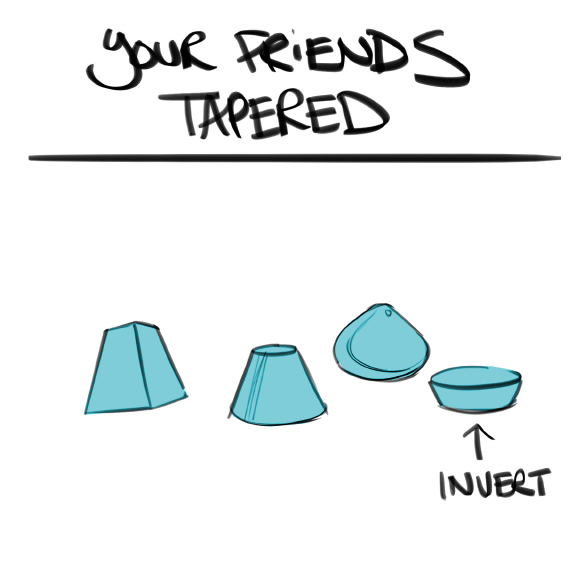 In fact, it's more interesting when they aren't. 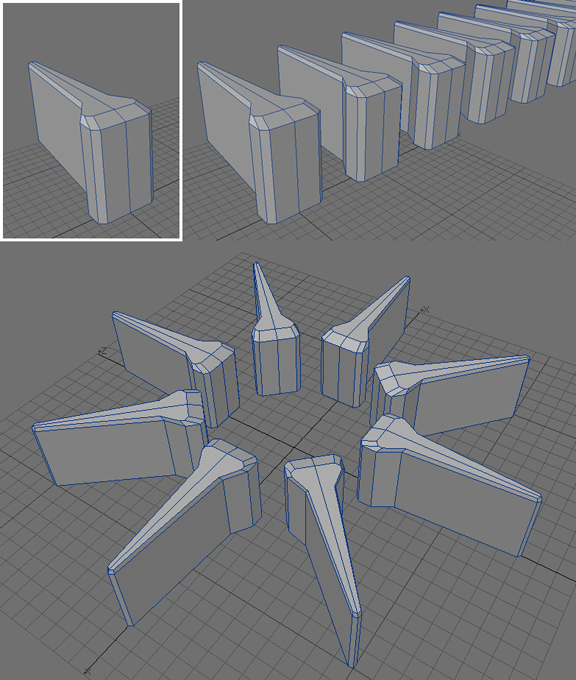 Experimenting with "offsetting" bevels. When you've made a piece of geometry once, it's possible to make it again, at different angles, using the same wielding and welding techniques. Organic objects can be cloned and arrayed easily and imprecisely, as inconsistencies in size and angle will work in their favor. 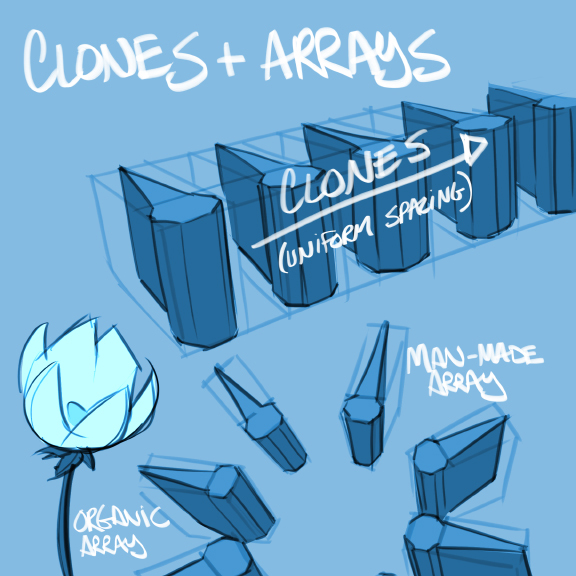 Accurate clones and arrays of man-made objects are the most tedious things to draw manually -- a chief reason 2D artists turn to 3D programs for help. 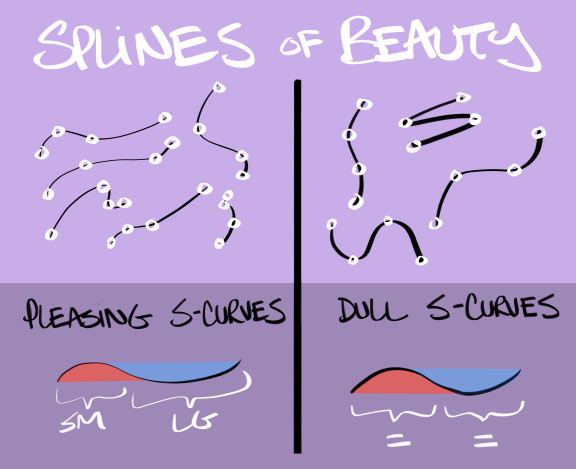 The "s-curve" is considered to be a line of beauty. There is a sweep, followed by a reversal of a greater or lesser distance. 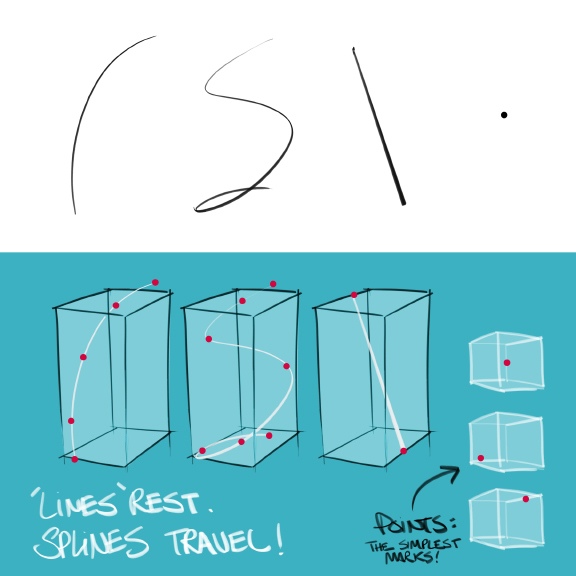 In wielding splines, we would do well to keep this 'small part/big part' relationship in mind. It's not enough to be able to draw symmetry in dead-on views; we must be able to do it in perspective with a minimum of fuss. Here's a 'projected symmetry' exercise to try. 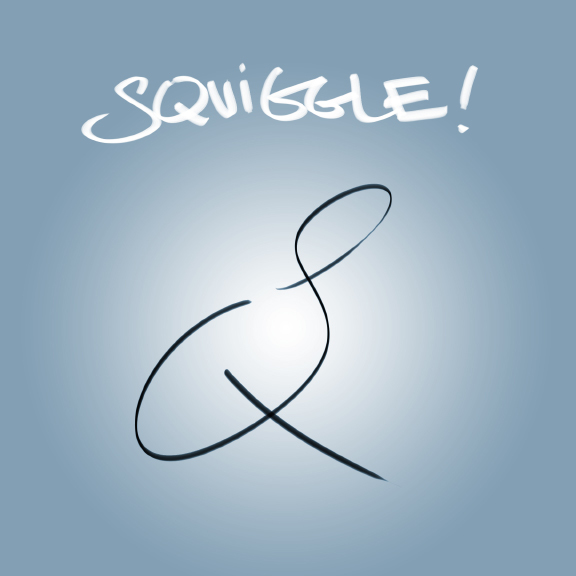 1) Draw a squiggle or series of random, meaningless marks. 2) Now try to think of this flat abstract as a three dimensional spline or splines. Feel some points recede, allowing others to come forward. There are infinite ways to interpret this, none of which are wrong. 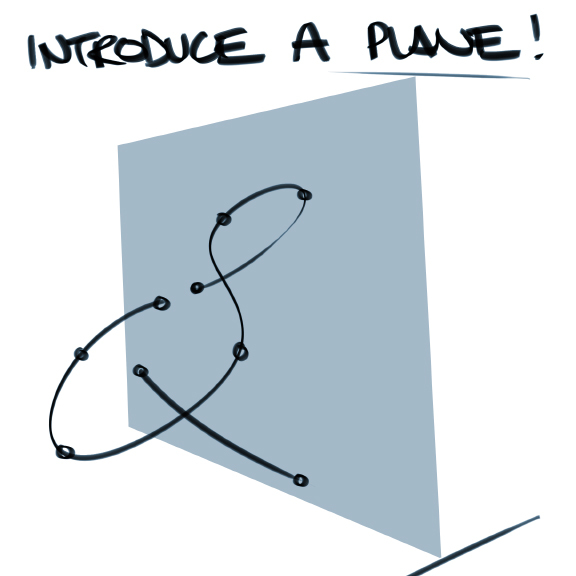 3) Introduce a plane, tilted in any way you wish, above, below, or to the side of your spline(s). This will be your symmetry plane. 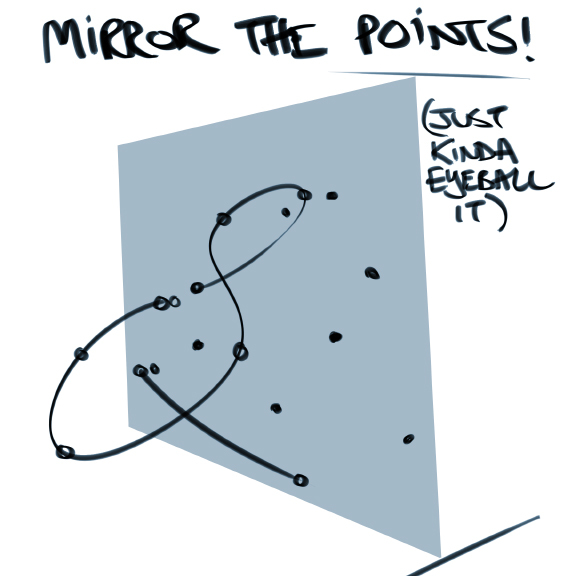 4) Try to loosely mirror the points, as you see them, to the other side of that plane. 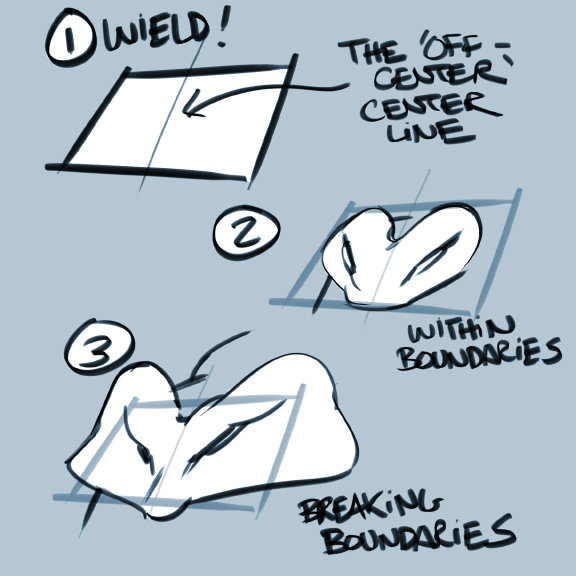 5) Once you've wielded these points, weld them together to create the projected spline. You don't need to get this exactly right. 6) The end result is a symmetrical wireframe "armature" which you can use to construct whatever you'd like. What does this armature suggest to you? Are there any additional points you wish to add? Let's call this "drawing under the influence of geometry." We won't always know how to draw something, but we might -- at the very least -- know its primitive makeup, the size of those primitives and how they might be arranged in space. Once that partial geometry has been wielded, we can then "connect the dots", welding in whichever manner pleases us. The more freehand construction is practiced, the less it's needed. 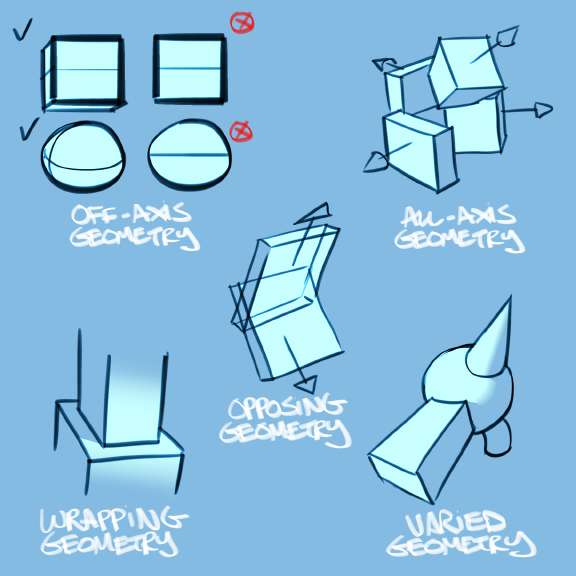 After some years gaining facility with these techniques, you may find yourself able to do much of it in your head without having to describe any primitive geometry whatsoever. Some may ask, "How are you able to draw without an underdrawing?" to which you may answer, "It's there; just invisible." 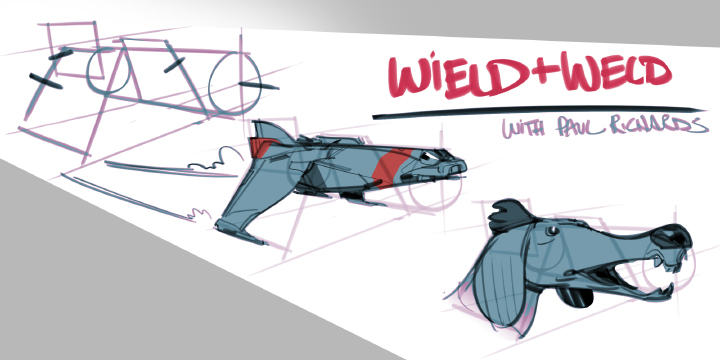 and weld, using our ever-deepening sense of perspective, there's no end to what can be conjured! This is an amazing post. So much useful information consolidated very usefully. 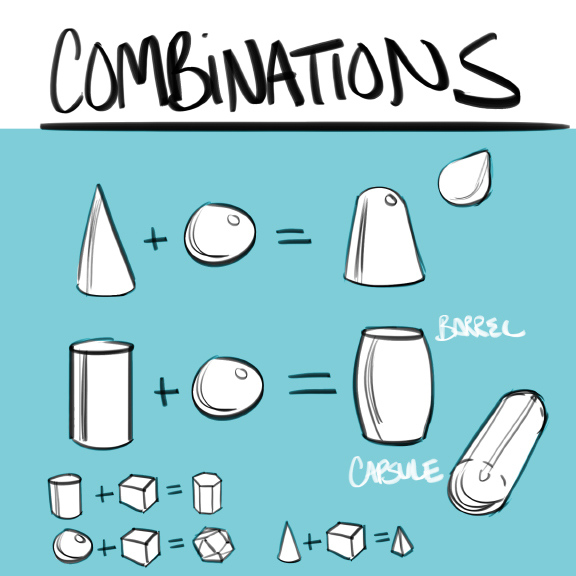 I'm going to be doodling a lot of shapes this week! I can't even begin to thank you for putting this all into words (and pictures). There are so many essential ideas here that took me years upon years to get even the vaguest idea of, and you've summarized them so clearly and quickly. Lots of inspiring exercises, too! WOW this is great. Thanks for post. Thanks for the mentioning. Happy, you found it worth sharing. This is a great post.you have a gift of making complex subjects understandable. Thank you.